This map identifies 25 eutrophic and hypoxic zones, with 3 having documented hypoxia and 22 areas of concern. 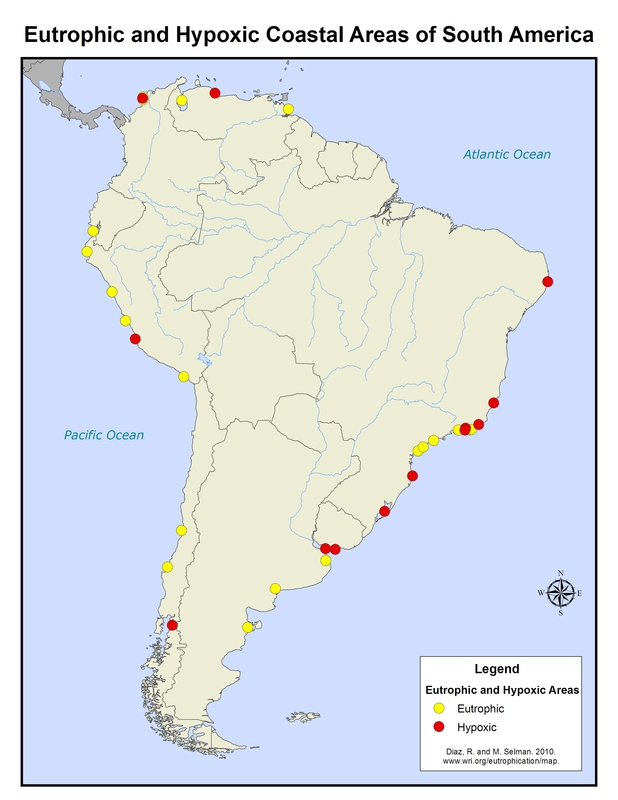 Most are found in Brazil, Chile, and Peru. This is most likely an undercount for the continent given recent increases in nutrient delivery to coastal waters related to agriculture, growing industry, fossil fuel combustion, and population growth. It is estimated that only 14 percent of wastewater, a key source of nutrients, is treated in Latin America and the Caribbean. Improved water quality monitoring and assessment is required to identify problem areas and their sources, and to develop strategies to reduce eutrophication.